The last week or so has been extremely frustrating to say the least with delays in shipping, lack of sleep and delay in Italian study. But, my parents have been the best. My dad has been doing yeoman’s work in getting my shipping situation worked out. It isn’t finished yet but we are moving forward. I am very lucky to have a Dad who always looks out for me and shows me what it is to work hard for people who are not yourself. But sleepless nights – the worst form of jet-lag I’ve every had – combined with this frustration and delay have made the days difficult. So when I was on the phone with my parents on Friday, my Dad worked hard for me and was most reassuring. My Mom was extremely cheerful and encouraging as she could tell how frustrated I was. At the time I didn’t take it well. I’m sorry Mom, as usual, you were right. In short she said, ‘go out, visit the saints, have a little gelato and read a book, let St. Aloysius be a friend since everyone else is away.’ I listened but was hardly receptive and she took all my angst with maternal cheer and showed me a lot of love. When I woke up on Saturday morning, which is to say when I got out of bed around 6:45 since I woke up at 1:05 and couldn’t fall asleep the rest of the night, which has been par for the course. I was ornery, upset and rather down to say the least. First, I chatted via Skype with one of the most beautiful women in the world. I am lucky to know her and she always brightens my day. I told her about my chat with my parents and she too encouraged me to take Mom’s advice and so I started the day. I was tired and irritable but off I went for the morning routine. It was slow to say the least but after the usual morning I decided I would heed my Mother and go out. The day was getting hot and was still feeling annoyed and frustrated with life and because of the heat I decided to go incognito, that is to say I wore the black shoes, black pants and light blue polo. I bought a couple of new polo shirts before I left, the first time in 4 years, and boy they make these things out of some funky stuff, very light and cool which was so helpful. Thus clad I went out int the Roman morning about 10:30 and headed to St. Peter’s so I could go to Confession, it was time to unload some spiritual weight. Speaking of weight, I’ve dropped about 7 pounds since I’ve been in Rome, the great effectiveness of the ‘don’t sleep and don’t eat’ diet. I left the back door of the Casa Santa Maria at 10:36 am, a bit later that I might have wanted to but there were some emails to answer and laundry to do. It seemed like the mood to take the scenic route to St. Peter’s so I could pass through some of the lovely areas of a lovely city. You see, I live so close to so many wonderful places, as does everyone who lives in Rome. First I went past the Pantheon – it is a wonderful building with a beautiful fountain in the square and, while flooded with tourists it is always worth seeing. 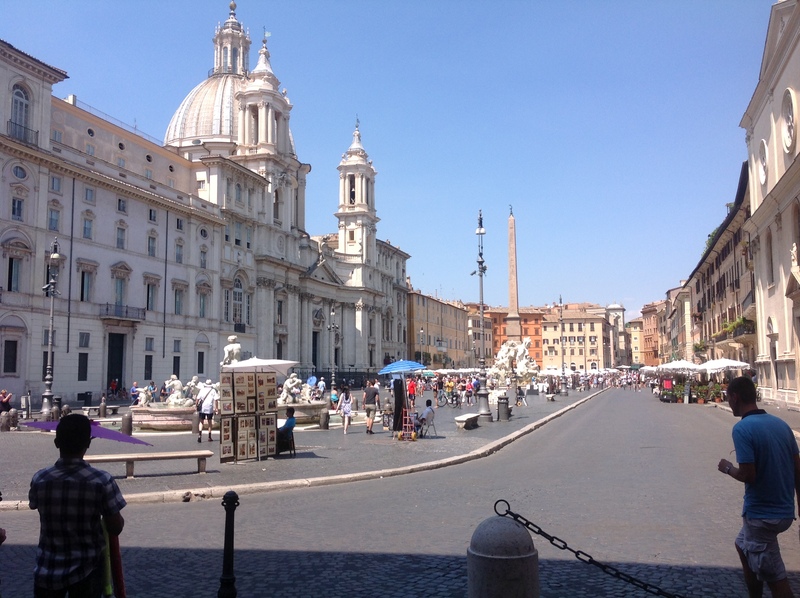 While to bus moves faster and there are quicker paths to St. Peter’s, I wanted to go through the great Piazza Navona, the most beautiful piazza in Rome. It also seemed fitting as the Piazza Navona is the site of the martyrdom of St. Agnes, one of my great loves and whose intercession I very much need. It’s true that this is a great tourist hub but it’s one of the things I love about the Piazza Navona, the great baroque church of Santa Agnese in Agone, built over the site of her death, the great fountains by Bernini with giant obelisk in the middle. That doesn’t even mention the beautiful baroque buildings all around, the restaurants the all of the painters, photographers, sketch artists, dancers and various others things. It is the most fun at night, but even in the morning there is a great beauty. 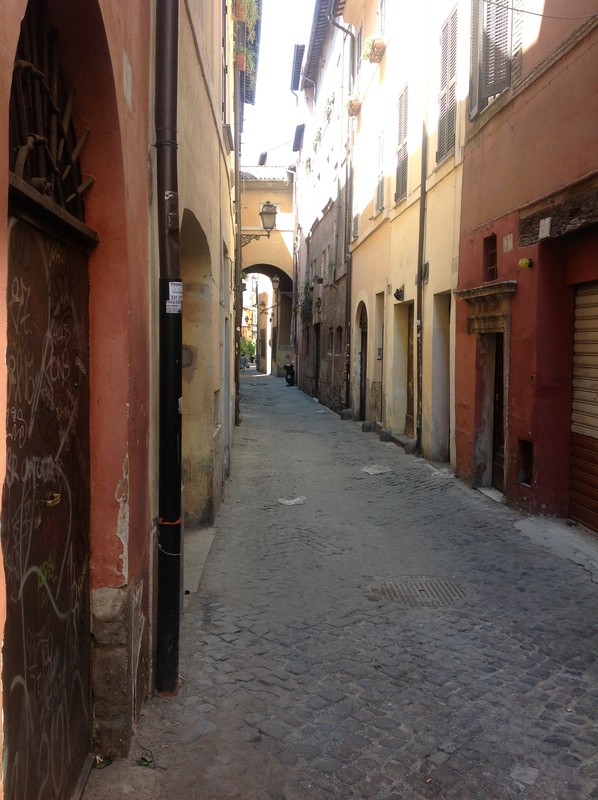 Even at 10:45 there was not much activity in lovely Rome but was very nice to walk when it was a bit cooler. The humidity is way up and it is better to be out while the temperature is cool and the shade is a particular helper. It is always odd to see this city slow and a bit empty, you realize how much tourism dominates the landscape. It was a pleasant walk through old street and along the old buildings. True, one might wonder, why so old, why not modernize more than they have? But there is more than nostalgia here, there is the hint of a world that paid more attention to interior realities or at least as much to interior realities as exterior ones. It is nostalgia, but more than mere nostalgia, it is a fallen world’s appeal to beauty and it makes for a nice walk down to the Tiber River. I was sure to cross the Tiber along the Ponte Sant Angelo, which leads across the river to the Castel Sant Angelo, old fortress of the Popes on the Western side of the Tiber. The angels along the bridge all hold the instruments of the Passion of Our Lord and, even though it is full of touristic types and the various persons hocking their junk it’s not that hard to be inspired to meditate on how the suffering of Jesus lead to the beauty of the Resurrection and life therein. 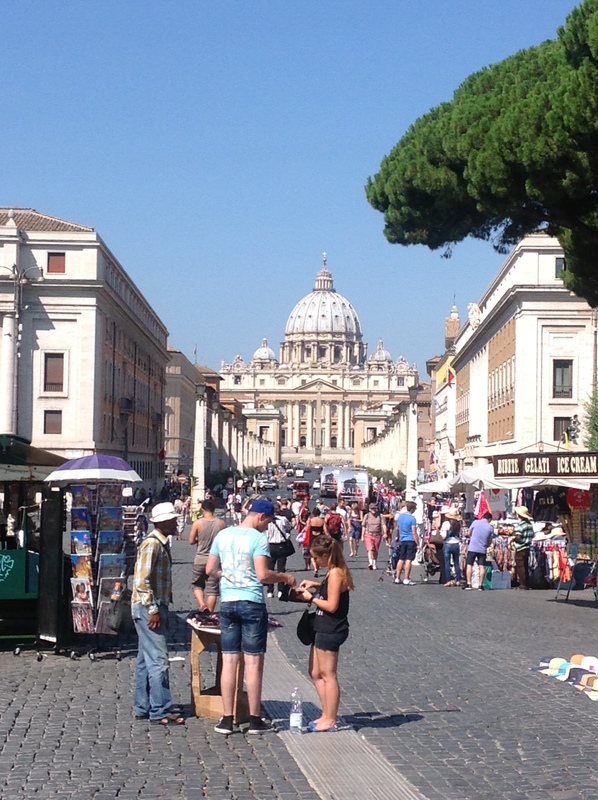 Plus, when you cross the bridge you turn left and get a stunning view and straight walk right up to St. Peter’s Basilica. By now it was a little before 11:00 and the tourists where out, especially around St. Peter’s. Two groups dominate the scene, Germans and Chinese. True enough there is every nation, race, language and tribe under the sun in the great Piazza San Pietro, there are special concentration of these two groups. As I walked up the the queue into the basilica I had a great fortune. I was trapped between tour groups, the one in back of me was German, the one in front was French. It is my own opinion that there is no language so strong and forthright as the German tongue and no language so light and cheerful as the lingua Franca. Were they here for pious reasons? Who knows. I listened happily to what seemed an odd yet beautiful symphony of chitter-chatter. Saint Peter’s was as usual, packed with people and loud. The ushers try, to no avail, to lower the voices of tour-guides and tourists alike. There is nothing other than wide eyes and a bevy of camera, smartphones and iPads taking all manner of picture of everything. Some of this I understand, some I don’t get at all. There must have been fifty or so people standing around the funeral monument of Queen Christian of Sweden. Famously and admirably she renounced the crown of Lutheran Sweden when she converted to the Faith in 1654. Her monument is in the upper part of the basilica while her body is buried down in the Vatican Grottoes. I wonder how many picture-takers at her monument know or cared about any of this? Did they have devotion to Queen Christina? Or did they, rather, see something pretty and take a snap like they did of every other pretty thing? My guess is that later – my guess is that all of the modern people, so surrounded and all sides by the sterile, technocratic, suburban convenience of their lives that can’t tell the difference between pretty and beautiful and that when they see anything that smacks of one or the other they must gobble it up with their technocratic power so as to posses it. 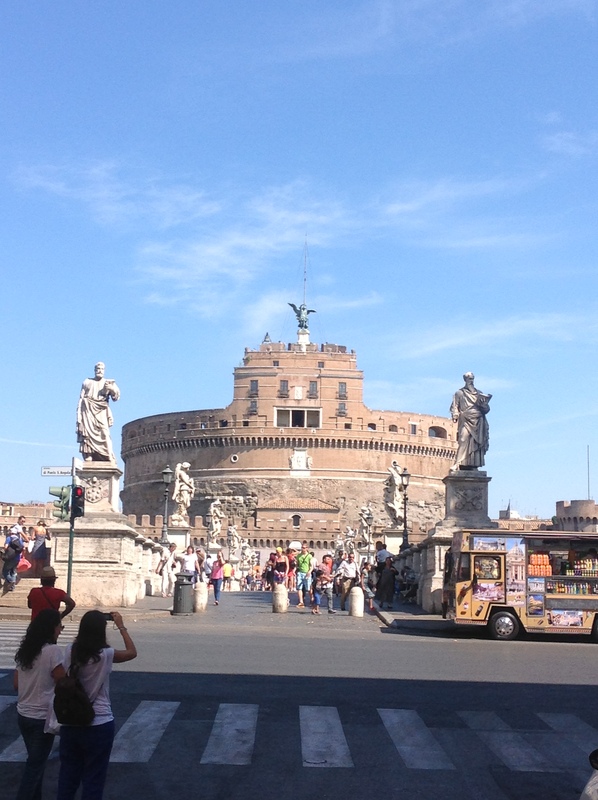 Thus there is so much picture taking around Rome. There is a dying capacity to be taken into beauty, such a thing frightens us, it demands of us, makes demands of us. So we picture take – no need to be drawn out of myself, such a thing is to scary for the sovereign self. You might find such a reflection odd in a post filled with pictures. I make a distinction – I have seen and meditated on all of these places I have photographed many times before and what you see are all the pictures I took and took for the purpose of this blog. Pictures have a great use, they can take us to a place where we are not and so the taking of some photos is a good, wise, even a holy endeavor. I simply wonder how many people spend their touring of great places behind a camera and in doing so may lose the capacity to enter into the thing before them. No more sermonizing, for now. I entered the great basilica, fought the photographs for a dip in the holy water font, greeted our Lady’s image of the Pieta and made for the Blessed Sacrament Chapel. This was harder than one might imagine as there was a great line to get in, guarded by the usher’s of the basilica. This is both a heartening and a sad thing. Heartening because there are so many who want into Our Lord’s Presence and because the church wants to make sure that place is kept for silence and prayer. Sad because so many want in to snap a secret picture and get out and it is a great effort to keep this holy place in a sacral sense. So, I simply stepped to the side to a window where I could catch a glimpse Our Lord through the window, made my greeting and then walked to the transept where confessions are heard. Blessed be God! I made my confession to Christ Jesus through a Dutch Franciscan who exhorted me to pray in a beautiful way. I walked away with deep peace, feeling the humidity, but with a deep peace. Easily I made my way out as the area of Confessions in the one place where the tourist is kept out. Oh, there are artistic glories there to be sure, and great saints (Gregory the Great and Josephat) but only those who want Mercy make their way in. After Confession I did go and wait my turn in line for the Blessed Sacrament chapel as it was only proper to a good deal of time with Jesus after going to Confession. The line had, mercifully, shrunk down quite a bit and after only about five minutes (including a bit longer delay due to the nuns who butted in line, which is a regular happening) I was in the chapel where I prayed for quite a while, about an hour. Our Lord was present in Eucharistic Adoration, which was especially beautiful – it is fitting beyond measure that Jesus Christ the Resurrected should be surrounded by all the splendor and beauty that the world can offer and have all that beauty fall into the simple white Beauty of the All-in-All that is Divinity on the altar, Whose beauty no earthly glory can match. When the time of prayer was finished I walked out again, a bit sweaty but full of goodness in my heart. The basilica was a bit un-comfortable you see. The temperature was much cooler than outside, the thick stone kept things quite cool. But the humidity was also much higher. The doors and some windows were open and many, many people came in so as the humidity seeped in it had nowhere else to go and so hung in the air. By the time I was heading out and had a clear sense of that cool, clammy humidity. Plus, it was nearly 13:00 and so the heat outside was up and the full flood of pilgrims and tourists were filling the basilica. So I left the Light of the World and entered the light of the world to make my way home. Brother sun was at full force by this time, it reached about 95 degrees and the humidity could certainly be felt. I had not eaten or drunk anything since I woke up and was feeling a bit un-comfortable. It was good to keep a little fast until confession and I have to say that my heart was full but I needed to find a little something to drink and so I did. It is fortunate that there are endless places for this right out of the square. I had three worldly goals that day; 1) buy soap, 2) buy a candle and 3) buy some flowers. The first was easily accomplished as I stopped at a place outside the square that sells many this’s and that’s made by various monastic orders from around Italy. I bought some very manly-smelling soap made by Trappist monks somewhere up north and felt that contemporary sense of moral goodness that comes from buying organic and went out into the Roman sun. Shade is a great friend on such days and I have become quite adept at finding the shade. It isn’t that hard once mid-day has passed as there are many buildings around the city and so you find the shady side (I look so forward to the day when, “The sun will not beat down on them, nor any scorching heat.” Rev. 7:16) and walk close to the buildings. 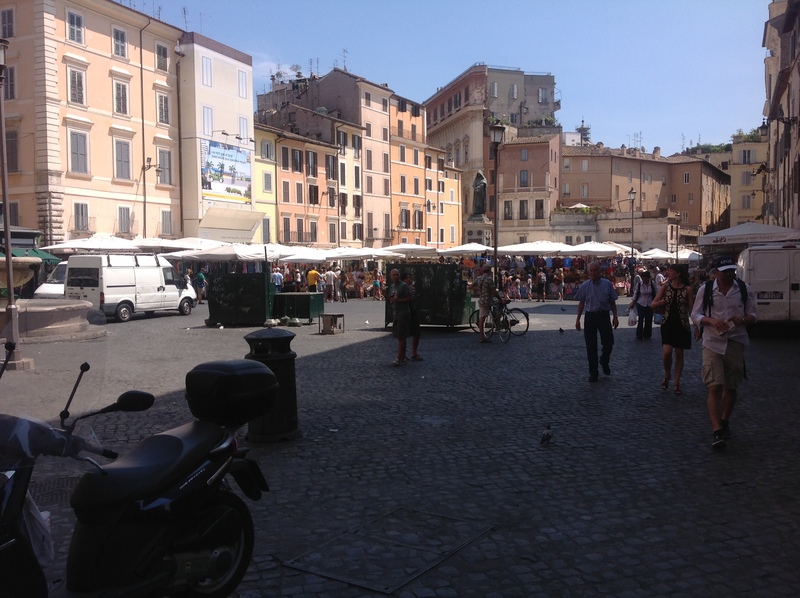 I walked back a different way than I came so as to go through and old part of the city and come to the Campo de’ Fiori, another one of the more famous squares (it’s more of a rectangle) in Rome. It was a bit sad as most shops were closed for the August holiday. I don’t begrudge them vacation but there are many art shops and other like places along those roads. They are also very old roads with many of the old buildings. 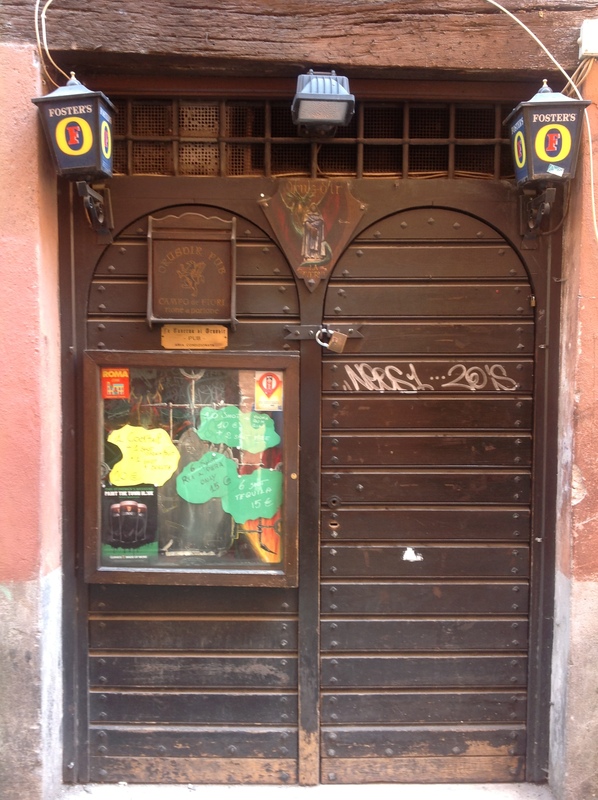 I made particularly sure to walk down the Via dei Cappellari, which comes right into the Campo de’ Fiori and has this tavern right near the end. I hope to one day to have a drink at the Crusader Pub, just to what it is like. While the Campo de’ Fiori was full of happy people, there were no flowers (fiori is Italian for flowers) and I suppose this made sense as it was about 13:30 and quite hot so I suppose that, if there had been any flowers, they would have wilted out in the heat so long. I thought I might search a couple of the local markets for some spirits and came to learn that Italians apparently do not have any affinity for bourbon so out I went back to the streets heading back to the Piazza Navona so that I might eat and then visit St. Agnese in Agone. Very near the square, almost on it but not quite, the is a restaurant called 4 Colonne that had caught my eye a couple of years ago and has been highly reviewed by the Roman restaurant critics. 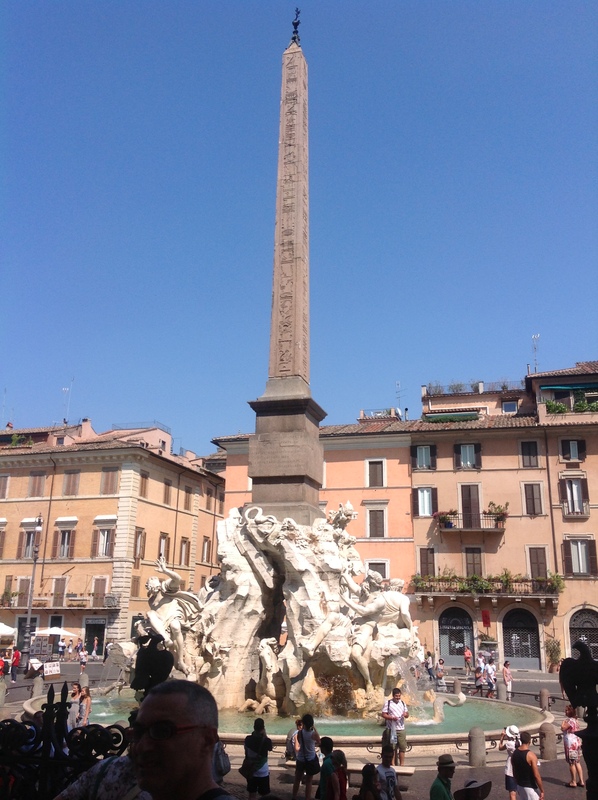 Previously the expatriates I was with that it would surely be ‘too touristy’ because it was so close to Navona. Indeed, I have found that, while there is truth to the clear tourist restaurants that only the expatriates – the long standing tourists – complain about touristy restaurants. Here is a little secret: there are nice restaurants near the famous places too. Why? Because the beautiful places are beautiful to both locals and tourists, why shouldn’t the locals want to eat while looking at something beautiful. So in I went and found a beautiful place. It was small and very clean with high walls and simple decor that was an interesting combination of classic and contemporary feel. Outside was a small deck with only about seven or so tables and from where I sat I could look out and see about half the Piazza Navona, including the great fountain in the middle. It as shaded and a light breeze was going which made for a comfortable place. Plus, it is just off the square and so it was rather more quiet. I read from the fiction I am currently enjoying and had a lovely lunch. It was excellent! The table setting was classic yet un-complicated the service was the best I have ever had in Rome and until that moment I had no idea how good carbonara could be. The only thing that could have been more pleasant would have been good friends about. When lunch was finished, it was a little after 15:45 I walked through the square and went into St. Agnese in Agone, visited or Lord in the Tabernacle and then went to the back chapel which contains the skull of St. Agnes. I must confess that I find the church of her burial, the basilica of St. Agnese fuori la Mura, to be a much more consoling place and easier to pray. But I wanted to greet my little saint – some have heard me say that, while I am completely celibate I do have a girlfriend, St. Agnes, who always does something to help me out or make me smile. There are always so many people who come in to see the great dome of the basilica and wander about that it is not easy to pray there, so I visited Our Lord who remains where He belongs, dead center in the sanctuary of the church, and then to visit St. Agnes’ relics and ask her help in keeping a pure heart and chaste life. It is a beautiful thing too when you step out of that church as you open right on to the great Fountain of the Four Rivers by Bernini. From there it is not far back to the Pantheon. I hoped the Vodaphone store might be open and I could finish the work to obtain a cell-phone but it was not so, another time. I did wander about some shops and look at many of the fun things but had no intent to buy. 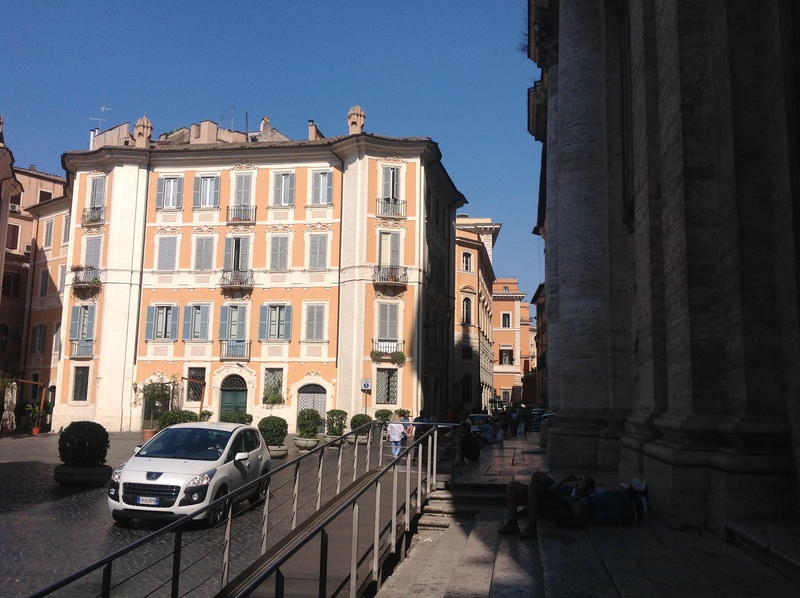 What a great area of Rome I live in, in the picture below you see the Pantheon just on the right and straight ahead the street that leads up the the Piazza San Igancio and then to the Casa Santa Maria. My mother had suggested I go pray by St. Aloysius and so I thought to do so. 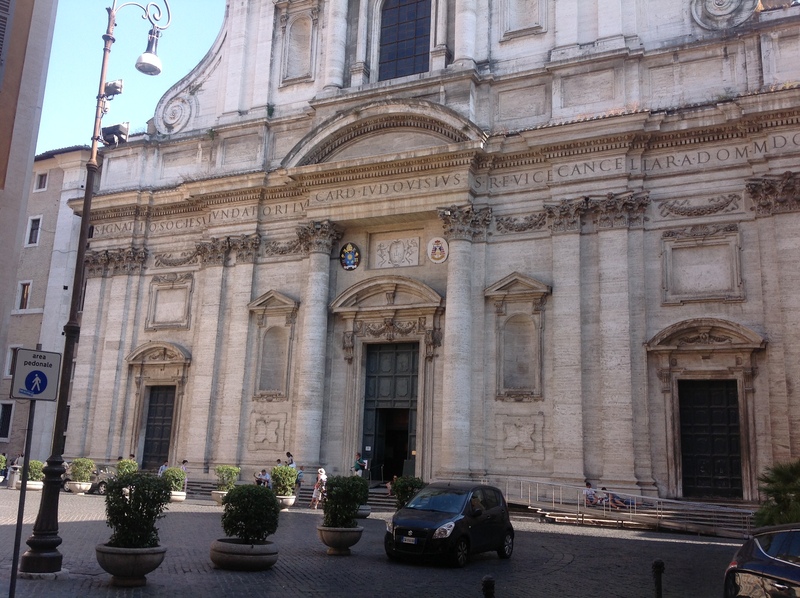 It didn’t take long to get to the church of San Ignacio (St. Ignatius) which does not have the relics of St. Ignatius but rather the bodies of St. Robert Bellarmine, St. John Berchmanns and St. Aloysius Gonzaga. I love this church, above the central nave is a painting that represents the evangelization of the world, there is an amazing side chapel of the Crucifixion, the Tabernacle remains in the center of a beautiful sanctuary and just off in the right side transept is the altar of St. Aloysius under which is his body. I sat down to do my afternoon mental prayer there. It was a bit difficult as the church as quite humid and I forgot that the late afternoon is particularly full of visitors and so it was a bit distracting with all the goings on. Nonetheless it was good to be there and pray and after the time of mental prayer go to the Marian chapel to say my Rosary. It all made for a great sense of peace in my heart, my mind and my soul. 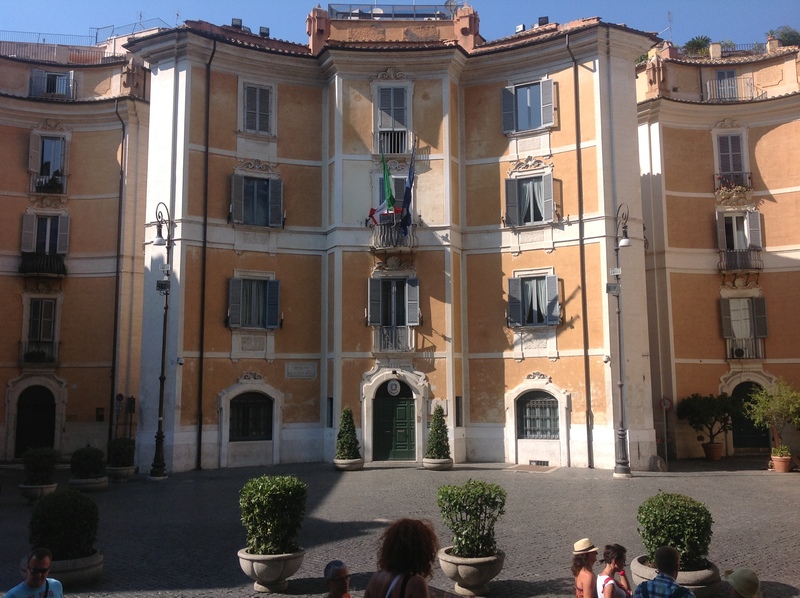 I walked out into the beautiful square, which I have tried to capture in photos – it is an amazing baroque square and only about three blocks away from the Casa Santa Maria and two blocks from the Pantheon. San Ignacio on the right, road to my house straight ahead. 1) There are all kinds of super-neat stores that sell all sorts of stuff I was looking for! 2) Rome is full of stores selling terrible liquor and finally I found two, less than a block away that sell the good ones! 3) The Trevi Fountain is about three minutes away from my front door! Sure, it is packed with people all of the time, but it is really very beautiful and a fun place to be. What a day, and by now it was after 17:00 and I was feeling rather tired. I walked back home and took a long, cold shower. After that I made some coffee – needed to stay away until at least 21:30 – and read from my novel. I had a lovely Skype with the Fassino’s and my parents, started writing this post and then went to bed. Laus Deo, I slept for the first time in ten days! Seriously, I have had a terrible time sleeping and last night I slept twelve and a half hours! Today has been a very smooth day – prayer, Mass, a short walk, lunch, reading, typing, about to Skype with some friends. All thanks to the good work of my parents and some particular enouragement from my Mom. Thank you, I love you! Listen to your mother, things might work out, at least if she is as good as my Mom! So many beautiful things are all around us. True, Rome has things more famous and many saints, but I bet there are beautiful things near you as well. Buon Domenica to you all, I love you from my priestly heart all the way from felix Roma! I know it’s a week late – listen if you like.